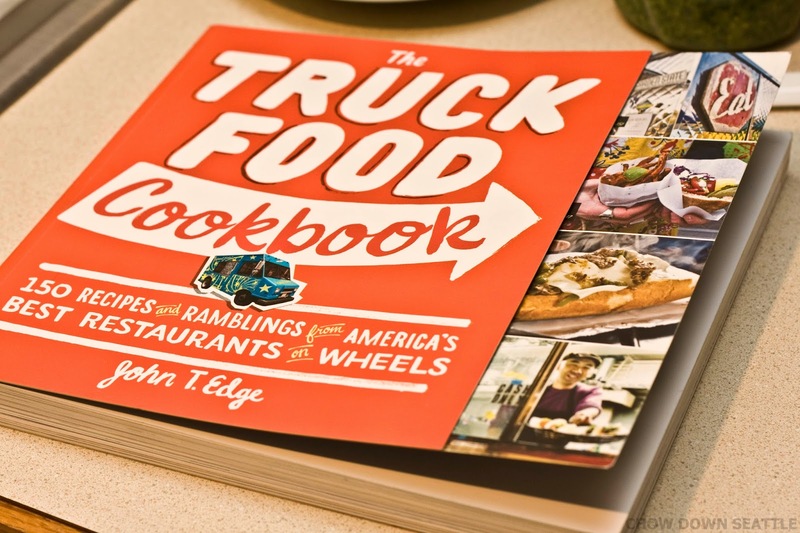 This past Christmas I received "The Truck Food Cookbook" as a gift. I love food truck food, so this was the perfect gift! To challenge myself, I have decided to cook one item from each section of this cookbook and see how each turns out. Food trucks have been becoming increasingly popular in the Seattle area. In most parts of the country, food trucks have been around for decades, but even though Seattle may be a little behind in the food truck scene, they have definitely made of for it in the quality and creativeness of their food. This cookbook has recipes from food trucks in California, Arizona, Oregon, Washington, Minnesota, Wisconsin, Texas, Pennsylvania, New York, and North Carolina. The first recipe I decided to tackle is for East L.A. Tacos from the Kogi Truck located in Los Angeles, California. Kogi Truck is famous for its Korean Mexican Taco. At first glance I thought that this recipe would be pretty easy, but little did I know that it is basically three recipes in one. Although I must say, all the work was worth making these delicious tacos. I slightly modified the recipe as it was printed. The first thing that needs to be made is the Korean Short Ribs. The short ribs need to be marinated in kalbi marinade for at least two hours, but I let them marinate overnight. I could have made it easy on myself and had the meat department cut the short ribs for me, but I figured I would do it myself. I think next time I will get them pre-cut. 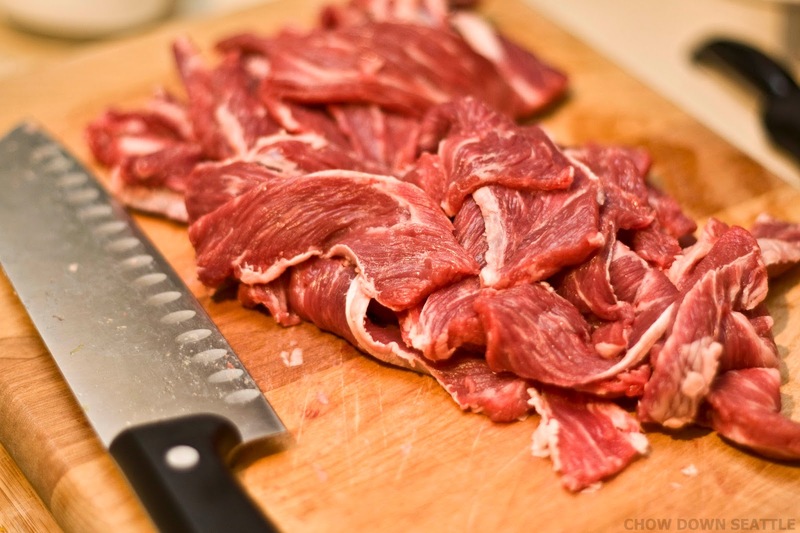 Place all of the ingredients, except for the short ribs, into a blender and puree until smooth. This recipe will make about 6 cups of marinade. It can be refrigerated for up to one week. 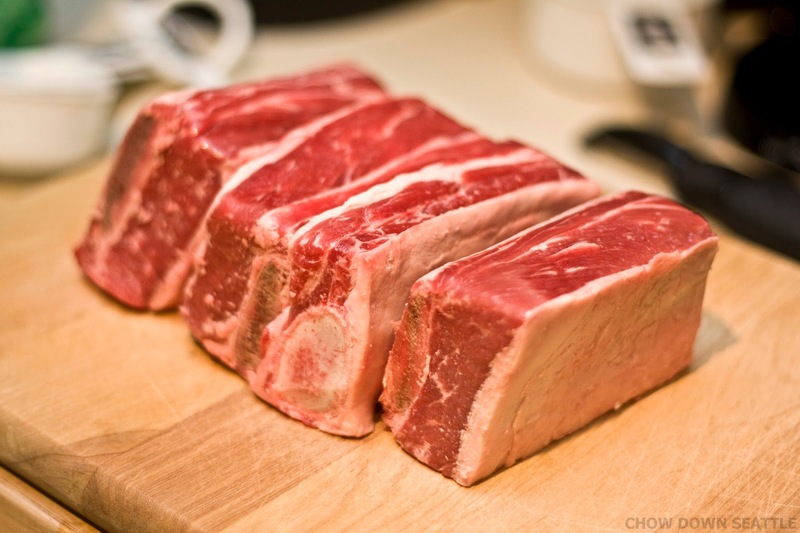 Place the thinly cut short ribs into a large resealable plastic bag. Pour the marinade into the plastic bag and massage the marinade into the beef. Let the short ribs marinate in the refrigerator for a minimum of two hours, or overnight. The recipe calls for the short ribs to be grilled, but since I don't have a grill, I cooked them in a skillet on the stove. Next, we need to make the Chile Vinaigrette. Place all of the vinaigrette ingredients in a blender and puree. The vinaigrette can be refrigerated for up to one week. Next, we need to make the Salsa Verde. I told you this recipe was like three in one, because basically it is. Heat the oil in a saucepan over medium-low heat. 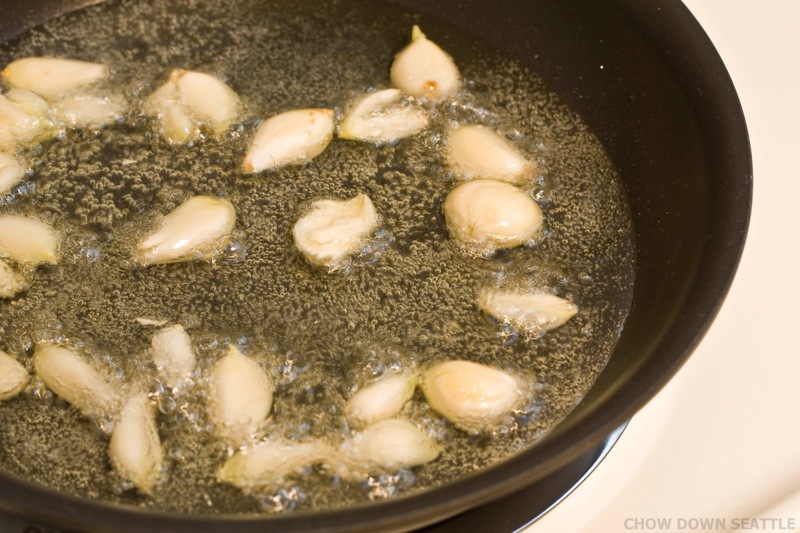 Add the garlic and stir constantly until they are a deep brown, about 3 to 4 minutes. Set the garlic oil aside and let cool. Next, char the onion and jalapenos in a cast-iron skillet, over medium-high heat for about 5 to 7 minutes. Remove from skillet and let cool. When the garlic oil and the onion and jalapenos are cool, place them with all the other salsa verde ingredients into a blender and puree until smooth. The salsa can be refrigerator for up to one week. Combine the onion, cilantro and lime juice in a bowl and set aside. Mix the cabbage, lettuce, and scallions with the Chile Vinaigrette in a bowl and set aside. If you would like to heat the 8 corn tortillas, you can add 4 teaspoons of canola oil to a cast-iron skillet over high heat, and heat the tortillas on each side. Place meat on each taco. Add a tablespoon of salsa verde, then add some of the onion and cilantro mixture on top. Lastly, place some of the cabbage, lettuce and scallion mixture on top. 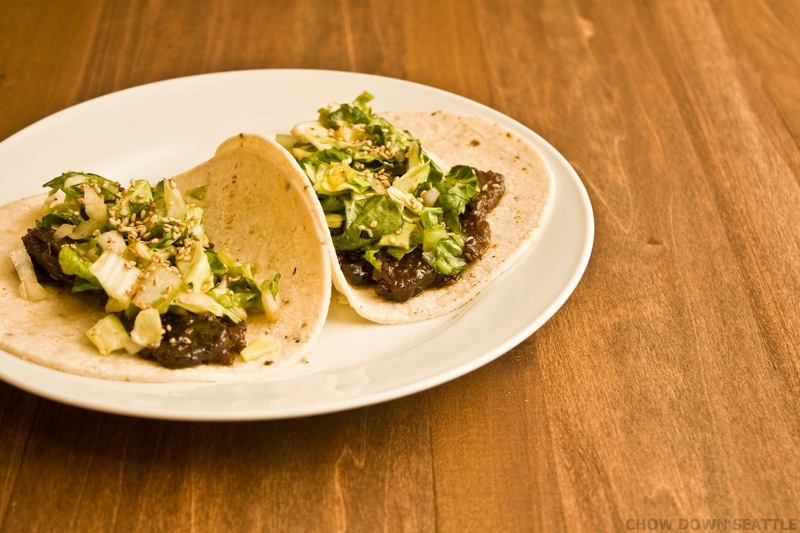 Sprinkle the tacos with the toasted sesame seeds. As you can see from this recipe, the tacos take quite some time to prepare, but like I mentioned, they are well worth it. If you want to check out the full recipe for these tacos and if you like food truck food in general, please check out The Truck Food Cookbook by John T. Edge at Amazon.com. Omgggg...I LOVE East LA food. Props on the cookbook project! I came across your blog to see if theres any info on top family friendly restaurants in Seattle. Any ideas? Only seen the Food Event Week blog...Thanks! Hi Julia's! Thanks for the comment. Good question! I'll do a post on family friendly restaurants in Seattle. I've been to both Julia's locations, and I have to say both are family friendly. :-) Check back soon for my blog post on more family friendly restaurants in Seattle! Those tacos look great! I'm definitely going to have to check out that book.